A Christmas Carol--Maker Stations! Teachers are busy this time of year, so why not make your life easier? I've done all the work for you. Your students will get 3 hands-on activities to creatively respond to this Dickens classic. I’m super excited about the newest product I’m putting together for my Teachers Pay Teachers store, Captivate Motivate Educate. It combines the timeless classic of Dickens’ A Christmas Carol, and makerspace concepts. My mind is racing with ideas like sculpting Scrooge’s transformation,and his mindset–before and after, and his thoughts on charitable donations. I’m thinking of including ideas for the build-it task cards. Build Scrooge’s future as described by the ghost of Christmas future. Students will use Legos, clay, pattern blocks, and maybe even multi-colored mini marshmallows! Another idea for the maker stations will be to use vintage Christmas carols somehow. . . I’m still working out the details. I’m going to work as hard as Santa’s elves to make sure this new product is uploaded to my store within the next week. tuned!! 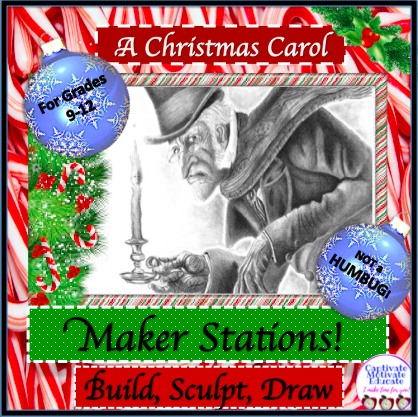 Next A Christmas Carol–Maker Station Style!